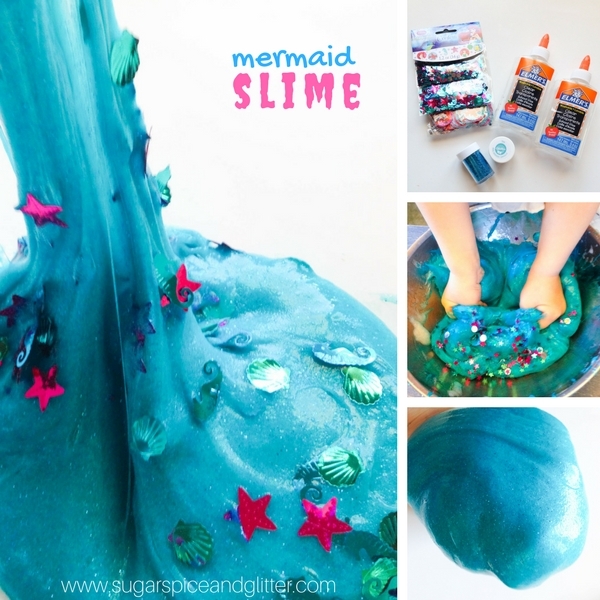 Kids sometimes need a little extra encouragement when it comes to bath time, or even just washing up after some messy activities. 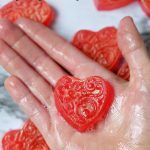 Running a home daycare, I had gotten in the habit of smelling little hands to ensure that soap actually was used in the hand washing process – but after realizing that I could make my life easier by making fun DIY soaps that the kids actually look forward to using, we have one less power struggle and the kids feel trusted and empowered. 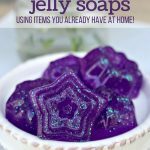 We’ve had so much fun experimenting with different homemade soaps – from Jiggly Jelly Soap to our Gluten-free Play Dough Soap. If anything, the kids now look for reasons to wash their hands! 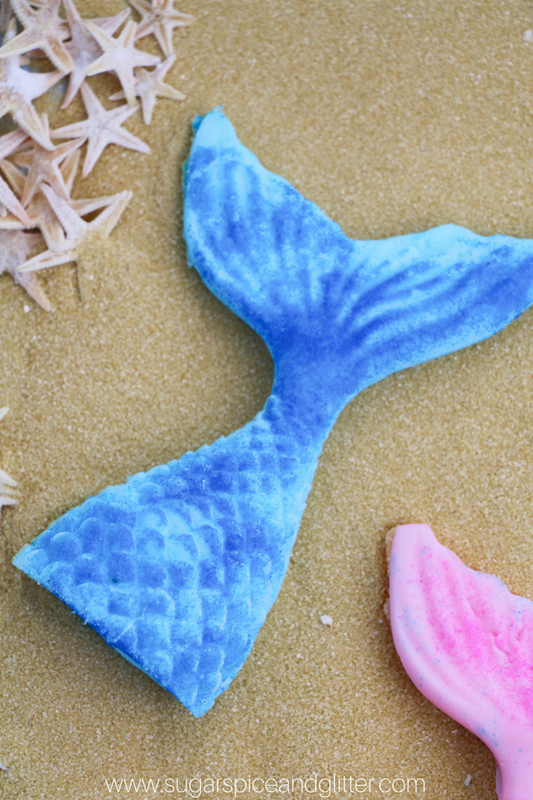 These soaps are actually not our first Mako Mermaids-inspired DIY – for Ella’s mermaid birthday party we also made a DIY Mako Mermaids Trident! 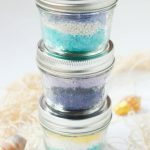 Tip: Mica powder is meant for beauty products, but if you don’t have some on hand or are not likely to use them in other bath products like lotions, sugar scrubs or bath bombs, edible shimmer powder might be more versatile for you. We’ve not had issues with food dye dying hands, but I’ve heard that can happen so we mostly use dye meant for beauty products/soaps. Of course, you can always leave the soaps plain/colorless if you’d prefer. 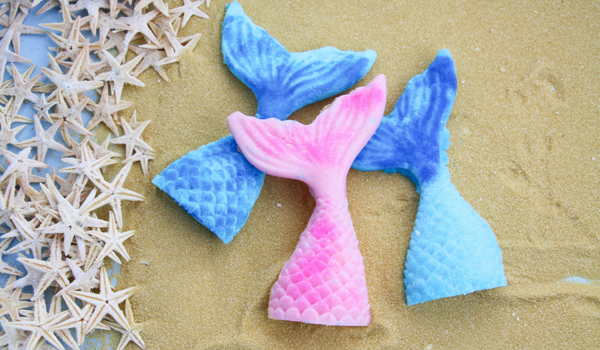 Sprinkle or brush the edible shimmer or mica powder onto the clean mermaid tail mold, less than 1/8 teaspoon per soap. 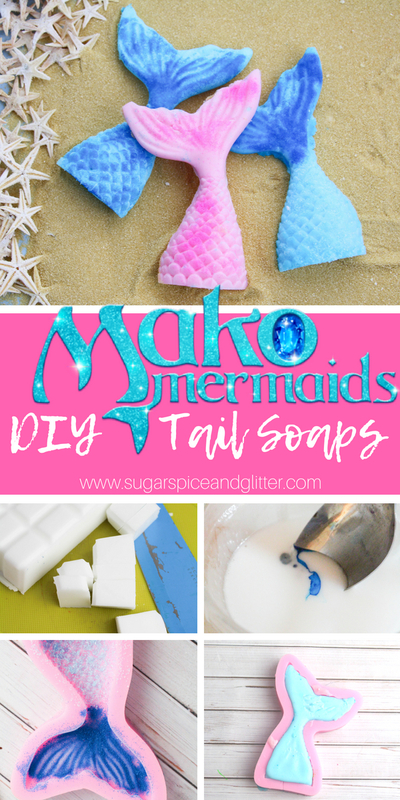 You will need approximately 2 cubes of melt-and-pour soap per mermaid tail, depending on the size of the mold you are using. That is approximately 4oz of soap each. 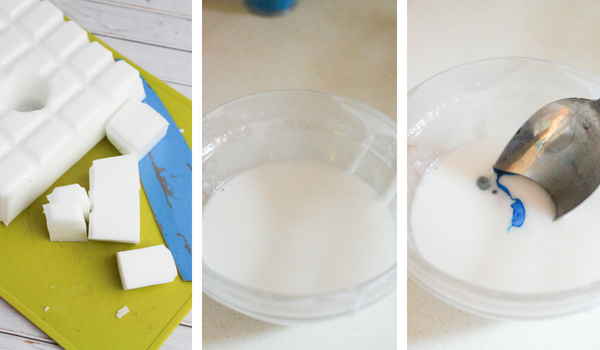 Chop up the melt and pour soap into smaller chunks, as shown, to encourage quick and even melting. Place the soap chunks in a microwave-safe bowl and heat for 25 seconds (or according to package directions). Our soap is always melted completely at this point, but if yours isn’t, give it a good stir and reheat for 10 seconds, as needed. Add a couple drops of the soap coloring and stir in well. 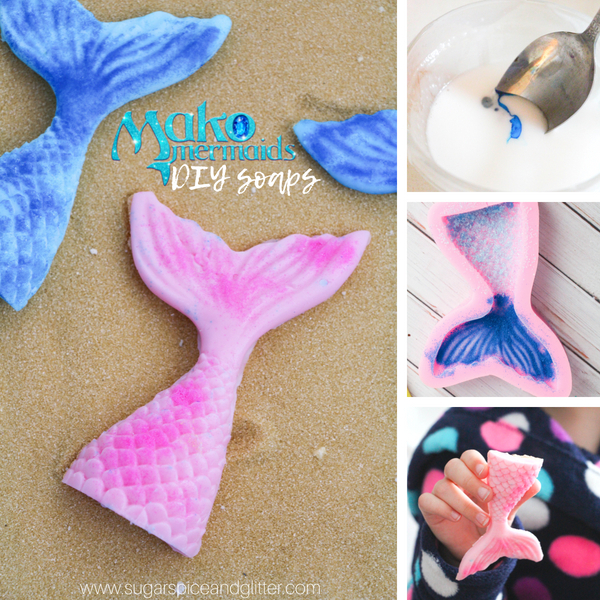 Spoon the melted soap into the mold to avoid spills. 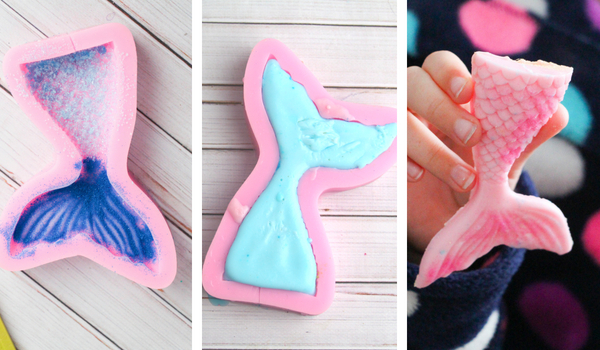 Fill in the thickest part of the mold first, and the soap will naturally start to fill in the rest of the mold. 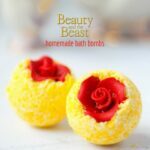 Check to see if the soap is completely hard to the touch – if there is any softness or movement, let it set for a bit longer. 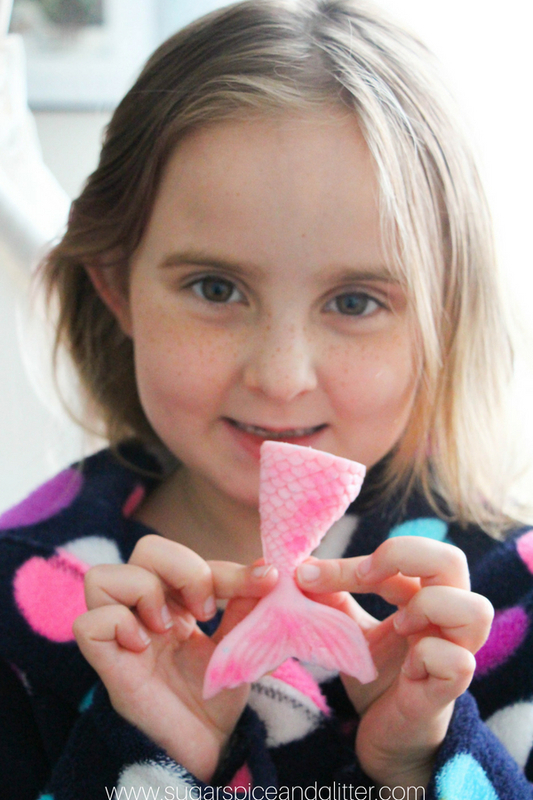 Carefully pop the mermaid tail out of the mold, ensuring that you are supportive and careful in any areas where the soap may be a bit thinner (for us it was that narrow area between the hips and tail). Package the soaps in cute bags if giving as gifts or place on the side of the sink as a surprise! Our soap is always melted completely at this point, but if yours isn't, give it a good stir and reheat for 10 seconds, as needed. 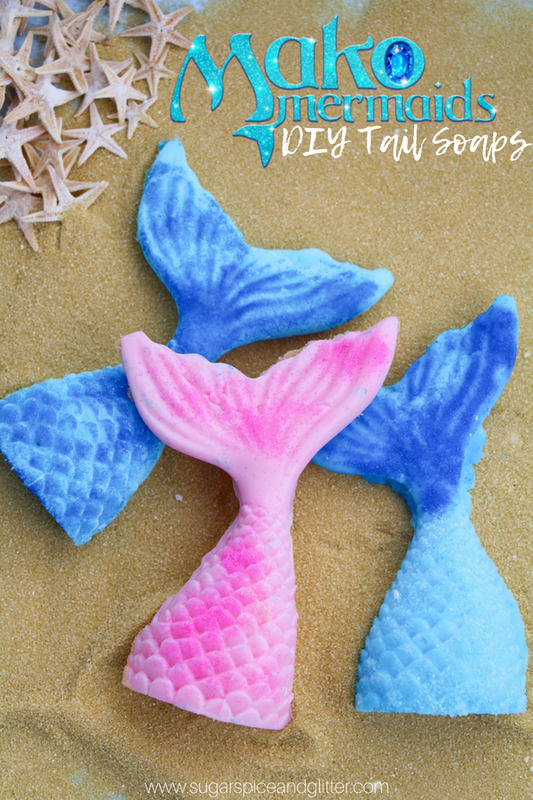 This cute mermaid soap craft is perfect for a mermaid party favor or for encourage little mermaids to suds up and get clean! 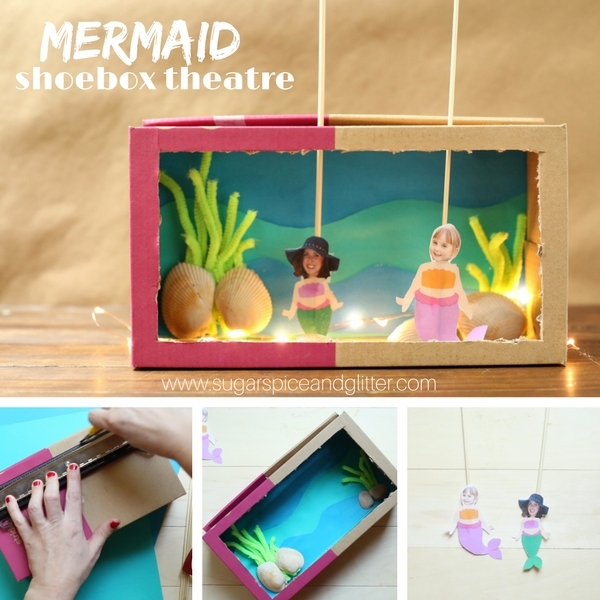 For more fun Mermaid Craft Ideas, check out our Mermaid Shoebox Puppet Theatre or our Sparkly Mermaid Slime.